I just got the message that the new bachelor program Informatikk: Digital Økonomi og Ledelse (Informatics: Digital Economics and Management) is now the most sought-after study program in Norway, with 19 applicants per available place (514 first-priority applicants for 27 available places). Since I have taken the initiative to this program and developed it with colleagues at the University of Oslo (where I have an adjunct position, this definitely made my day. Week, actually. This entry was posted in Academically speaking, Digitalization, Notes from a small country, Teaching on April 20, 2017 by Espen. Yesterday I got an email from an old friend and former colleague who is visiting Norway and wondering what to see and do. His is not the first email of that kind – and it dawned on me that the rational and productive thing to do (well, it is early Sunday morning and I am still undercaffeinated) is to write this up as a blog post. (Did the same thing for my Norwegian friends asking me about what to do in Boston.) So – what would I recommend if you should find yourself in Oslo during the summer, with some time to look around? So: If you are going to Norway, pack good shoes, rain gear, basically the light hiking setup. You may not need it, but you certainly won’t regret packing it. As the saying goes here, there is no such thing as bad weather, only bad clothing. And we mean it. The Vigeland park (or Frogner park). This is the world’s largest sculpture park dedicated to one artist, Gustav Vigeland. And, as every American says who has been there – they are all naked! Vigeland was a pupil of Rodin and the sheer size and rather playful humor of the place is enjoyable and a sure hit with the kids. (My favorite: The little girl who, unseen by her parents, is picking up a snake. See if you can find it.) One of Oslo’s city symbols is “Sinnataggen”, a little boy having a tantrum. This is also where people in Oslo go to relax and hang out if the weather is good, so you might see some locals. The Holmenkollen ski jump, especially if we can throw in a little walk in the woods. The ski jump is impressive in itself (though ski jumping is no longer the enormous draw it used to be for Norwegians) and you get an excellent view of Oslo. There is a zip line if you feel adventurous. But, to really have a Norwegian experience in the sense of doing something the locals like, walk from Frognerseteren to Tryvannsstua (pictured, about 3 km) or Skjennungstua (5 km, view, delightful pastries) to get a sense of Oslomarka. Oslo is 63% protected forest, with gravel roads, paths and (in winter) hundreds of kilometers of prepared ski tracks. Heavily used by the citizens of Oslo and surrounding municipalities. The Munch museum, a bit run down, will probably move to a new building in 2018/19 [closed for moving to new location 2019] but the paintings are, of course, worth seeing. The Viking Ship museum. The museum itself is crowded and due for an update, but it is the only place in the world, as far as I know, where you can see a complete, real Viking ship. Worth the trip. If you are feeling energetic, there are lots of other museums (at the Bygdøy peninsula, take a boat there from the City Hall). I have taken people to the Folk Museum a lot – mainly because two of my daughters have had summer jobs there and can provide an inside perspective – but it requires a deeper interest in folklore and rural history than most people have (but if you go there, make sure to sample the Hardangerlefse, cooked over open fire. Carbs galore.) There is the Fram and Kon-Tiki museum, as well, though I haven’t been for many years. Plus Huk, a nice beach, if you feel like a dip. Explore the fjord – Oslo is built around the fjord, and if you can get on a boat – even just taking a summer ferry out to some of the islands – by all means do it. (I live on an island, perhaps I am a bit partial here.) In later years, the city has tried to make the shoreline available for walking (a project called Fjordbyen) and it works rather well. The high point, of course, is walking on the roof of the Oslo Opera House, but the Akershus Fort and just hanging out slowly sipping a cold (and expensive) drink while ogling the historical boats you find here and there is nice, too. Explore Oslo by bike or foot. The urban bike project is pretty good, you download an app to your smartphone and check out and in bikes from many places. Best path: Along Akerselva. Grünerløkka (partially along the river) is the “bohemian” (well, gentrified) district, Frogner is more upscale, Grønland for immigrant food and culture, and Gamlebyen for history. If you want to say you have seen something not many Norwegians have seen: The Emanuel Vigeland mausoleum, created by Gustav Vigeland’s, well, rather eccentric brother. Opening hours are complicated, but if you have been there, you have definitely seen more of Oslo than most people. Norwegians are quite cynical about this. Do not expect there to be signposts and security fences in the mountains or along the fjords – but if there are, obey them religiously, because they denote real dangers, not risks of lawsuits. Every year, some tourist will fall off Trolltunga or Vøringsfossen, step too close to a calving glacier or drown in a fjord because they did not have the wits, skills or equipment necessary. That is considered to be the tourists’ fault. At Svalbard, tourists are referred to as “Bamsemums” (a popular foam-bear-covered-in-chocolate candy) because of their propensity to end up as polar bear lunch, on account of going where they are not supposed to without a gun. Something of the same spirit prevails in most of Norway, though in some places (such as Trolltunga), the local authorities are thinking about fencing things in a bit, mostly because it is so expensive to haul the bodies out. Yes, I am exaggerating a bit. But not much. With that out of the way: The best way to see Norway is to amble around (preferably in an electric car), stop whenever you feel like it, and (thanks to the Viking-age freedom to roam) go for a walk in your hiking shoes. Norway is all about nature, and there is so much of it that practically anything is worth seeing. That being said: The south coast is mellow and sunny and idyllic, the west coast is spectacular with deep fjords and high mountains, the North (north from Trondheim, that is) goes from New Zealand fjords to Alaskan tundra. The Eastern forests offer opportunities for canoeing and fishing, if you are into that. The mountains in the middle have peaks and glaciers and mountain huts, managed by the truly wonderful Norwegian Tourist Association. Explore at your leisure, spend time, and above all, do not feel forced to see the famous sites, when you can find something almost as good quite close. Knutshø (pictured, steeper than it may look) is dramatic, close to the road, has fantastic views, and there are not many people there. Perfect one-day walk: Park the car and do it, walk along the ridge, return along the lake on south side. Great view of Besseggen. Bitihorn is another, less dramatic alternative. If you want to get above 2000 meters, try Rasletind. If you don’t fancy walking, taking the boat from Gjendesheim to Gjendebu and back is worth it. While reading Three in Norway by two of them. Ålesund is a beautiful little coastal city which burned in 1904 and was rebuilt in Art Noveau style. Many Norwegian cities were architecturally brutalized in the sixties and later, but Ålesund has kept its style. Trondheim is nice – and Baklandet Skydstation has been named the best cafe in the world several times. I love it. And it is close to the only bike lift I know of. Trondheim is a university town – primarily the technical university, Norway’s MIT. Bergen is nice – the whole city – perhaps with an exception for the fish market, which has transmogrified from local and lively market to a canned tourist experience the last few years. Will probably be fixed. Take a tram or cable car to the surrounding hilltops*. The south coast has lots of beautiful little towns with white-painted “skipper” houses. I like them all – Lillesand, Grimstad, Arendal, Tvedestrand, Risør, Kragerø – but if you somehow can get to Lyngør, it is absolute perfection in summer. Tromsø has nightlife and nature and the most active local patriots in Norway. And that is saying a lot. I quite like the Henrik Sørensen museum near Holmsbu. Svolvær and Lofoten and the other Hurtigruten things are fantastic, of course, don’t misunderstand me, but they tend to fill up. You cannot see the northern lights in the summer. Sorry. Nor the midnight sun in the winter. Norway is expensive and service is friendly but overstretched (we have near wage equality and employees are very expensive…). Do not expect fawning service, even at fancy hotels. Norwegians are rather reserved and have a fairly expansive sense of personal space. When the other people at the bus stop are keeping their distance to you, it has nothing to do with you. It’s them. (See The Social Guidebook to Norway for further information). And that is that. Comments welcome. More to follow as I remember things. *No, not mountains. I Norway, any mountain with trees on top is a hill, no matter how steep or tall. This entry was posted in Itinerancy observations, Notes from a small country, Relax a bit, Up close and personal on April 9, 2017 by Espen. Warning: These are notes taken live. Errors and omissions will occur. No responsibility whatsoever. Blockchain much wider than Bitcoin, will facilitate new business models. Blockchain transfers rather than copies digital assets, making sure there is only one instance of it. Walt Disney looking at Blockchain (DragonChain) for internal transfers, also use it for tracking supply chain to their cruise ships. Opensourced it. what is holding it back? what are the incentives and adoption models? what are the hard costs of Blockchain? can Blockchain be compromized by a virus? and that was that…recording will be at webinar.acm.org in a few days. This entry was posted in Academically speaking, Business as unusual, Digitalization, Security and privacy, Technology strategy and tagged blockchain, disruption on April 7, 2017 by Espen. I have been asked to give a keynote speech at a conference on case teaching in Vienna, at the The University of Applied Sciences BFI. This is quite an honor, and I am very much looking forward to it. Should you happen to want to be in Vienna and focus on case teaching on May 19 – well, I hope to see you there! This entry was posted in Academically speaking, Case teaching on April 4, 2017 by Espen. We are currently seeking partners for marketing and further developing this platform outside the Norwegian emergency service market. Please contact me (self@espen.com, +47 4641 0452) or Fredrik Øvergård, CEO (fredrik@radvice.no, +47 977 32 708) for further information. This entry was posted in Entreprenurship, Security and privacy, SmartHelp, Technology strategy on April 4, 2017 by Espen. 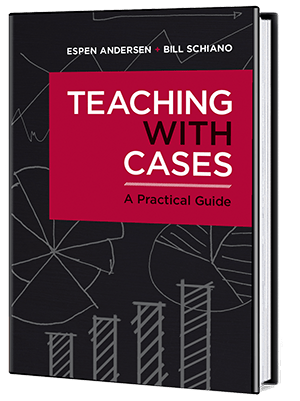 In our book Teaching with cases: A practical guide, Bill Schiano and I talk at a fairly high level about how to give effective student feedback by using a spreadsheet and personalized emails. Our argument is that by giving every student individual feedback in addition to the grade, you reduce the number of grade justification requests and complaints. This blog post is a detailed guide on how to do it – too detailed for the technically inclined, probably, but we all have to start somewhere. You probably already have all the tools you need on your computer – a spreadsheet and an email client that works with your spreadsheet – such as Excel and Outlook, for example. (For myself, I use Excel and SerialMailer, a cheap serial mail client for Mac.) You can probably use online software as well, for instance a Google spreadsheet (which is nice because editing by more than one teacher is easy) and Gmail, though I have never tried it. The idea is to use the spreadsheet to organize all your feedback, and to set it up so you use as little time as possible to give as much feedback as possible. I will demonstrate this, with an example for a fictitious course with three in-class sessions (with participation grading, 40% of grade), an individual written examination (30% of grade), and a group assignment (30%). I will show the various details of building the spreadsheet below – if you want to skip ahead and inspect the thing your self, I have made it available for downloading. Note that I also create a group numbered 0. This is what I use for students who drop the course or don’t do the group assignment. …and then I am ready to start teaching my course. As the course rolls along, I enter points and comments for each student. As mentioned in the book, it is extremely important that you do the participation evaluation immediately after each class. I tend to give the students a score of 1-3, sometimes 1-6, with some definition. As I will show later, what scale you use does not really matter, as you can normalize them to whatever you want later in the process. Anyway, assume the course is finished, and you have entered comments and points for everything – for the individual student, in the Student sheet…. To finish the evaluation part (we’ll get to communication later), you need to a) match the group points and comments to each individual student, b) calculate a final score for each student, and c) determine the letter grade for each student. Now we are ready to communicate the results to the students. We will do that by writing a letter to them, composed largely of common text (i.e., feedback that is the same to all students), and them use the mail/merge function of word to merge in the individual details from the spreadsheet. As said above, I use a product called SerialMailer on my Mac. The concept is simple: You write the letter, link to the spreadsheet, and insert field names into the text. When the letter is sent out (or printed), the field names are substituted for the values for each individual student. And there you go. Now hit “Finish and Mail Merge”, and select whether you want to print the documents on paper (or PDF) or send them out via email (shown). This entry was posted in Case teaching, Teaching, Teaching hacks on April 3, 2017 by Espen.